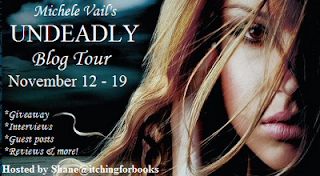 Welcome to my stop on the blog tour for Michele Vail's Undeadly, hosted by Shane at Itching for Books! Today I have for you all you need to know about the book, an excerpt, and a giveaway! So sit back, relax, and enjoy the show! Michele Vail writes young adult paranormal fiction about zombies and reapers. She likes reading, dogs, cats, board games, ghost-hunting shows, and Halloween. She believes in magic, in the impossible, and in the restorative powers of chocolate. Michele lives happily-ever-after with her Viking and their family. You can find her at her website or by following her on Twitter. 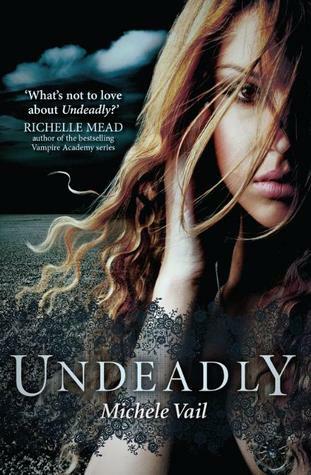 Undeadly is available November 20, 2012 from Harlequin Teen. You can order it from Amazon and add it on Goodreads! Mortimer stared at the ground, looking like the most pathetic zombie ever. I sighed as I headed toward the door at the other end of the room. I wasn't much for my sister's whole save-the-zombies effort, but I have to admit I wouldn't mind seeing Mortimer put to rest. I'd bet his wife ran him just as ragged when he was alive. At least now, he didn't know it. I tucked poor Mortimer's leathery limb under the crook of my arm, pulled my keys out of my pocket and unlocked the door that led to sahnetjar. I heard a noise behind me. Startled, I turned and found Mortimer three inches away, his jaw cracking as his mouth opened impossibly wide. I dropped the keys (duh), backed against the door, and held out his severed arm like an old, bent sword. Then Mortimer tried to eat me. Ohh, what's going to happen?! Check out Undeadly to find out--it's released very, very soon! Thanks for stopping by, and don't forget to enter the giveaway!